What is Thinking at the Edge? Escucha tu propia melodía con TAE! Everyone is so inspired and encouraged by the Women’s March. How can we create new ways of acting in the world that directly address today’s political realities and at the same time reflect our deepest needs, goals and values? Marshall Rosenberg’s theory of Nonviolent Communication has a lot to offer as we learn how to navigate this new political landscape. We need to step into our roles as courageous peacemakers now more than ever, so I want to make Focusing, NVC and and Thinking at the Edge available to people involved in political and social change. I’d love to give a free one-hour introductory course online, so that you can see if you’d like to continue with the full 8-week course online or in person. Leave a reply below and we will work something out! How can we create new ways of acting in the world that directly address today’s political realities and at the same time reflect our deepest goals and values? The old theories about how the world works don’t seem to hold water anymore. Focusing and Thinking at the Edge help us develop new ideas based on our own lived experience. Maybe after the march you have an inkling about something you’d like to make happen, or participate in, but you can’t quite put it into words. With Thinking at the Edge, you will be supported in listening to and valuing this inkling, based on your own life experience. Spacious listening allows your inkling to develop into something you can talk about and act on. Thinking at the Edge involves tuning in to the bodily felt sense of your inkling. That’s called Focusing. I will help you get into Focusing if you are not familiar with it. We need to step into our roles as courageous peacemakers now more than ever, so I want to make Focusing and Thinking at the Edge available to people involved in political and social change. I’d love to give a free 2-hour introductory course in your community, so that you can see if you’d like to continue with a course which can be given either online or in person. Leave a reply below and we will work something out! I want to share with you the delightful spirit of the traditions of El Salvador in this piece by Salvadoran poet Eric Doradea, inspired by legends of the beautiful spreading guanacaste or conacaste tree with its ear-shaped seed pods. It graces the landscape and provides welcome shade in the dry Pacific regions of Central America. The tree is called conacaste in El Salvador. 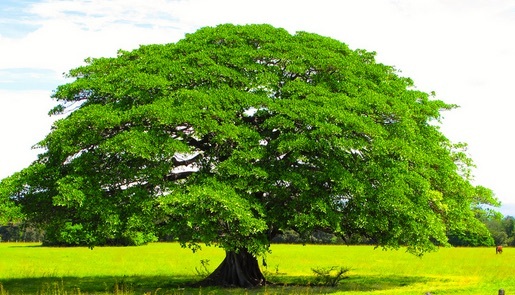 It is the national tree of Costa Rica, and the namesake of Guanacaste province. Conacaste comes from Kuyu, the Nahuatl word for tree, and Nakas, the word for ear. In Nahuatl, Kunakas is the Tree with Ears. The grandmothers say that the Tree with Ears is a refuge for those in need of rest. Its presence is like an elder brother who knows how to listen. Many gather around it to tell their secrets. patiently listens to everything they have to tell it. Its replies are not always silent. like the spell of four hundred snakes shaking their rattlers at once. to the wanderings of the heart. and listen intently to the thoughts of the heart. Conacaste proviene de los sonidos Náhuat Kuyu: Árbol y Nakas: Oreja, Kunakas: árbol de oreja. Cuentan las abuelas que el árbol de orejas es casa para quien quiere descansar y su presencia es la de hermano mayor que sabe escuchar, que a su cintura muchos se acercan a contarles sus secretos, le hablan de sueños y amores, el árbol con sus cuatrocientas orejas pacientemente escucha todo lo que tienen que decirle, sus respuestas no siempre son en silencio, cuentan que el sonido de sus frutos sacudidos por el viento recuerdan la música, la magia, el encantamiento de cuatrocientas culebras moviendo sus cascabeles. Las abuelas cuentan que sus abuelas primeras aprendieron el oficio de escuchar, que todas las tardes cuando se cansaba el sol escuchaban el atardecer, el vuelo de los pájaros, la locura del río, el dormir de las flores, el andar del corazón; cuenta que saber escuchar es el mejor remedio contra la soledad, que en noches de luna madura reúnen a los más pequeños en la cintura del árbol de Orejas y escuchan atentamente lo que piensa el corazón. I observed my first 5-foot long leatherback turtle laying her eggs about 30 years ago. I felt that I was witnessing an ancient and sacred ritual that somehow connected me and all humans to these amazing reptiles. They have have roamed the Earth’s oceans for the last 100 million years, and are now threatened with extinction. For many years, as author of a guidebook to Costa Rica, I made sure to tell my readers about how important it is to follow certain rules when observing nesting sea turtles. The mother turtles emerge from the sea, where they are used to floating gracefully, and slowly and clumsily make their way across the sand until they find the place that feels right to dig their nests. The path made by their flippers looks like tractor treads on the beach. The whole process takes place after dark. Most mother turtles are in the sea again by dawn. There is something very similar when one is listening to a Focuser. Experienced Focusers will sense the moment when their talking about a situation has taken them to the point where their felt sense tells them “here is where you can go in and find something new”. At that moment, the Focuser must be protected in his or her process. As Jim Iberg describes in his article The Three Phases of Focusing, the Focuser is “parturient”–bearing or about to bear young; bringing forth or about to produce something, such as an idea. 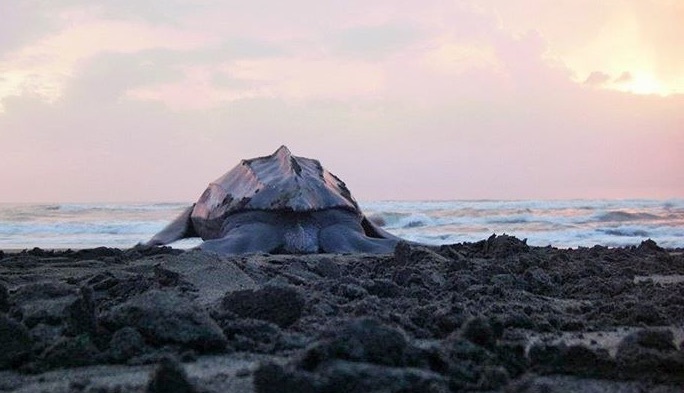 When mother turtles see lights at night on the beach, they often turn around and go back into the sea before digging their nests, thus the need for guides who understand their process. Focusers too can get distracted by the lights coming from other minds. Their bodies are calling them to dig down into their own tenuous and unclear truth. If disturbed at that moment, their relation to the pre-verbal felt sense can be broken. The Focusing partner must be sensitive to that moment. After the Focuser as started to “lay eggs”, the Listener reflects back as faithfully as possible the words that are being born. The faithful reflecting back allows more new words and ideas to be born. Leatherback turtles lay about 110 eggs in each clutch! The Thinking Domain: The Focuser often has to talk for awhile to find the place where the felt sense invites him or her to “go in”. Effective Listening at this stage can involve reflecting back or summarizing just the main ideas expressed, so that the Focuser knows that the Listener understands. If the Listener really gets lost about what the Focuser is saying, it is OK to ask a clarifying question so that the Listener and Focuser feel that they are on the same wavelength. But an intellectual understanding of the Focuser’s issue is not really necessary in order to foster the Focusing process. The Felt sensing domain: The Listener reflects back the exact words that are coming from the felt sense. Usually the Focuser pauses and speaks more slowly than in the Thinking Domain. The Listener can take in the shape and texture of the words being born from the felt sense. The Self Empathy Domain: When the Focusing process is blocked, it usually involves some kind of lack of self-empathy. Reminding Focusers about the necessity of self empathy is very important while someone is learning how to Focus. Usually, experienced Focusers have their own ways of finding the right kind of empathy for themselves and don’t need to be reminded. They will notice when they come up against a place of self-judgement. During the Focusing process is it not appropriate for the Listener to bring in his or her own ideas and suggestions. Those can be expressed if the Focuser clearly requests feedback after the session is complete. However, one never knows what effect one’s words will have on someone who has recently given birth to an idea that only minutes before was held silently in the body. It is best remain silent so that the Focuser can fully experience the new place where he or she has landed.